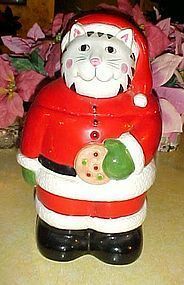 VINTAGE SANTA Claus COOKIE JAR by Coco Dowley collectible Christmas display! 12 1/2" tall, 20" in circumference. Nice condition with no chips or cracks! No box. Very cute Santa Kitty Cookie Jar! Add some character to your holidays!